When it comes to your home and your home landscaping, you want to be able to show it off to the world, even at night. If you have high quality landscape lighting, you can illuminate your home, plants and trees in the darkness of night. Landscape lighting can be thought of as a work of art, a creative endeavor. And when you start planning your landscape lighting, you want to have the very best. Sonoran LanDesign, a company of Phoenix landscape design professionals, has shared some tips and tricks to create a magical and eye-catching display for your home and garden. What Makes Up a Landscape Lighting Voltage System? Nowadays, landscape lighting is a low-voltage system, which is much safer and easier to work with. A low-voltage system works off step down power from your home. There are four main components that work together in a landscape lighting system. Transformer: This component works to reduce the household current, which is typically 120 volts, and brings it down to 12 volts for the landscape lights, which is much safer than the regular household current. Bulb: This component determines your electricity usage, and gives you a few options when purchasing your lights to decide on brightness, beam width and color. It’s up to you to decide the look and feel of your lights, and the bulb is where you start. Stake: This is what holds the fixture in place. Sturdy stakes will withstand weather and have a better chance of staying upright, instead of falling or breaking due to inclement weather, such as a bad snowstorm or rain storm. Cable: This is what carries the electrical current to your lights. It may not seem like it’s an important part to know, but it is. Much like the stake for the light, the cable is an integral part of keeping your entire lighting system working and making your garden and home look beautiful. If you do not want to spend thousands of dollars paying a professional to put up landscape lights, don’t worry! A simple lighting system can be installed in a weekend. Now, if you are thinking of doing something more elaborate, then you may want to consider consulting with a specialist. According to This Old House, “For the most stunning effects, go with a landscape lighting specialist familiar with the various fixtures and ways to arrange them.” But if you are more of a do-it-yourself type of person, you should have no problem creating a beautifully landscaped and lighted yard. If you are thinking of going with a professional, keep in mind that the installation can range from about $2,000 to $2,500. For a DIYer, know that you can get fixtures on the relatively low end for about $20, plus about $.70 per foot of the transformer. Another great tip if you are installing a lighting system yourself is to use a timer to control your lights. A wireless keypad is your best bet because then you don’t need an electrician to install your timer system. This will save you time and money. Before we dive into what lights you should get for each area of your home, let’s talk about upkeep for your lighting system. The best advice on how to keep your landscape lighting looking its best is to keep the fixtures free of debris and leaves. And when a bulb burns out, be sure to replace it immediately, this way you don’t have to worry about larger voltage shortages in the future. Know what type of warranty your fixtures have. They can range anywhere from one to 10 years, which is typical for both the fixture and transformers. When thinking of the material of your fixtures, keep in mind that copper, brass and stainless steel should keep their shine for many years. These types of fixtures might be best if you live in a climate that experiences all the seasons or is prone to a lot of rain and snow. Now that you know the general guidelines for the upkeep of your fixtures, it’s time to turn toward what type of landscape lighting fixtures you should be using for both your garden and your home. There are many different types of fixtures and lighting, but we are going to focus on four specific types. When it comes to landscape lighting, you want your landscape and your home to pop, to have the best curb appeal in the daytime and at night. These lights will do just that. Think about it from the perspective of HGTV: “Ask yourself what your purposes are for wanting illumination in your backyard.” This will help you determine exactly which features you want to highlight and what light fixture is best to do just that. Bullet light fixtures are some of the most versatile landscape lights. They are compact and project a narrow beam. These are perfect for up-lighting features of your home, trees and different type of garden structures. Well light fixtures are waterproof landscape lights that can be buried in the ground. They provide light without showing the lighting fixture. This light is great for water features or for lighting foliage. Garden light fixtures are structured with a canopy on top of a post, which is usually either 18 or 24 inches in height. 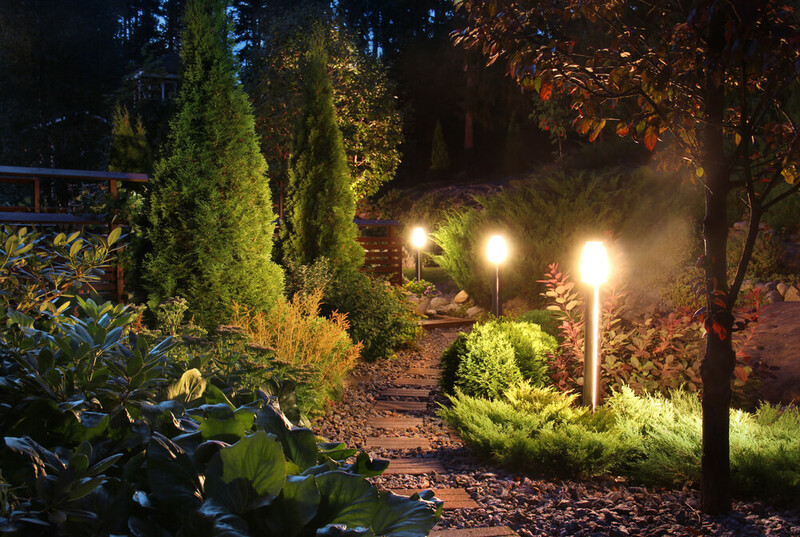 These lights are the best for pathways or over-lighting on gardens. Wash light fixtures have a softer beam that is perfect for flatter surfaces, such as a privacy fence or walls in your garden. There are many different retailers that sell lighting systems. While some offer packages or discounts, others sell each lighting fixture and transformer separately. What it comes down to is your needs as a consumer. And everyone is different, especially a DIYer. But, if you need direction on where to shop for landscape lighting and keeping it budget-friendly, Amazon has some great options. The great thing is that you can purchase your landscape lights in a bundle, or you can purchase them individually, which is good if you need a few lights for your project. They have some great options, like this Volt Lighting Adjustable LED in-ground well light or a set of Zuckeo 5W LED Landscape Lights that come in an 8 pack , which is perfect for the budget-friendly DIYer. Ultimately, it’s up to you to decide what’s best for you and your landscaping needs. Just keep in mind that the best landscape lighting doesn’t have to break the bank. Whether you want to consult a professional or take on the task yourself, whatever you decide, your home and garden will look amazing. And all the hard work you put into keep your home and garden in tip top shape will really benefit from landscape lighting. Illuminating all your hard work on your home and your garden can really show off your creativity. And remember it doesn’t have to break the bank. Remember to turn to Amazon when you need a refresh on your landscape lighting and always use a timer.